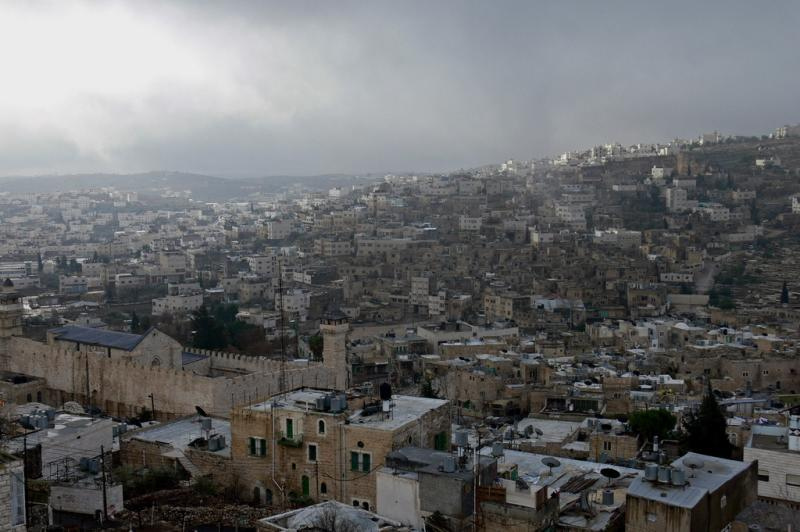 In the Palestinian village of Sebastiya, Christians and Muslims alike honour a connection to John the Baptist at a location earlier known for the worship of Phoenician gods and a Roman emperor. 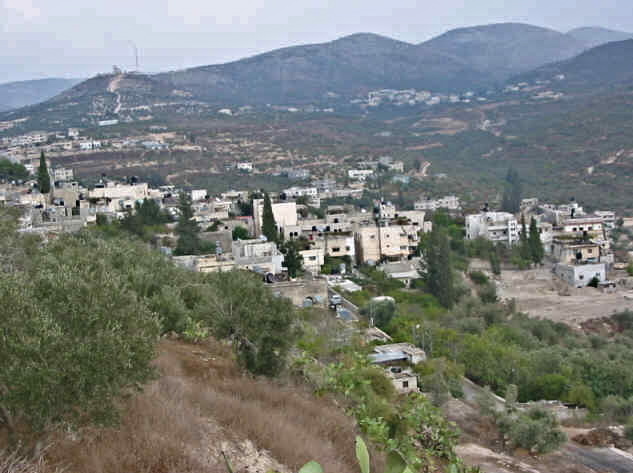 Sebastiya (with various spellings including Sebaste and Sebastia) is about 12 kilometres northwest of Nablus, to the east of the road to Jenin. An early Christian tradition, from the first half of the 4th century, says John the Baptist’s disciples buried his body here after he was beheaded by Herod Antipas during the infamous banquet at which Salome’s dance enthralled the governor (Mark 6:21-29). 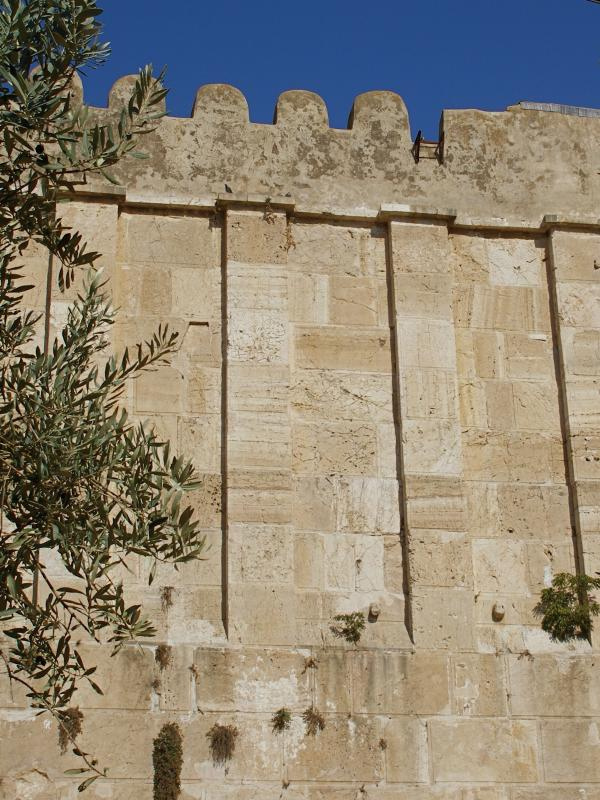 An Orthodox Christian tradition holds that Sebastiya was also the venue for the governor’s birthday banquet, though the historian Josephus says it was in Herod’s fortress at Machaerus, in modern-day Jordan. 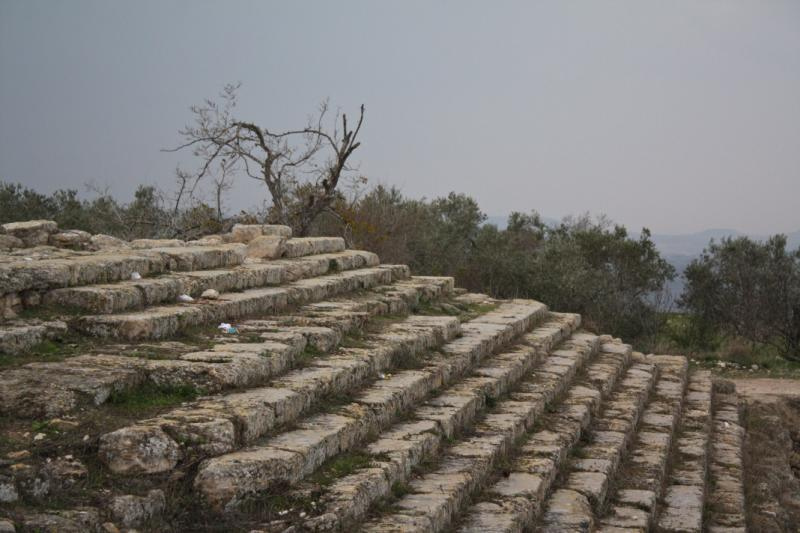 Overlooking the present village of Sebastiya are the hilltop ruins of the royal city of Samaria. The city is mentioned more than 100 times in the Bible. Excavations have uncovered evidence of six successive cultures: Canaanite, Israelite, Hellenistic, Herodian, Roman and Byzantine. The surrounding hill-country, its slopes etched by ancient terracing, has changed little in thousands of years. 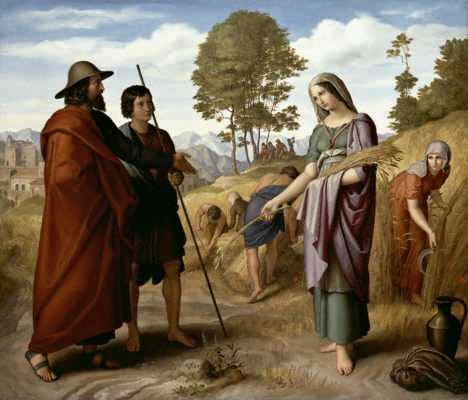 When the early Christian community dispersed during the persecution that followed the martyrdom of St Stephen, the deacon Philip preached the Gospel in Samaria and was joined there by the apostles Peter and John. Omri, the sixth king of the northern kingdom of Israel, built his capital on the rocky hill of Samaria in the ninth and eighth centuries before Christ. His son Ahab fortified the city and, influenced by his wife Jezebel, a Phoenician princess, built temples to the Phoenician gods Baal and Astarte. Ahab’s evil deeds incurred the wrath of the prophet Elijah, who prophesied bloody deaths for both Ahab and Jezebel. During its eventful history, Samaria was destroyed by Assyrians in 722 BC (ending the northern kingdom of Israel), captured by Alexander the Great in 331 BC, destroyed by the Maccabean King John Hyrcanus in 108 BC, and rebuilt by the Roman general Pompey in 63 BC. Herod the Great expanded the city around 25 BC, renaming it Sebaste in honour of his patron Caesar Augustus (Sebaste is Greek for Augustus). Herod even built a temple dedicated to his patron, celebrated one of his many marriages in the city, and had two of his sons strangled there. The pattern of destruction and rebuilding continued during the early Christian era. Sebaste became the seat of a bishop in the 4th century, was destroyed by an earthquake in the 6th century, flourished briefly under the Crusaders in the 12th century, then declined to the status of a village. Christian sources dating back to the 4th century place John the Baptist’s burial at Sebastiya, along with the remains of the prophets Elisha and Obadiah. Around 390, while translating the Onomasticon (directory) of the holy places compiled by Eusebius, St Jerome describes Samaria/Sebaste as “where the remains of John the Baptist are guarded”. By then, according to a contemporary account by the historian Rufinus of Aquileia around 362, pagans had desecrated the tomb during a persecution of Christians under emperor Julian the Apostate. The Baptist’s remains were burnt and the ashes dispersed, but passing monks saved some bones. In the 6th century two urns covered in gold and silver were venerated by pilgrims. 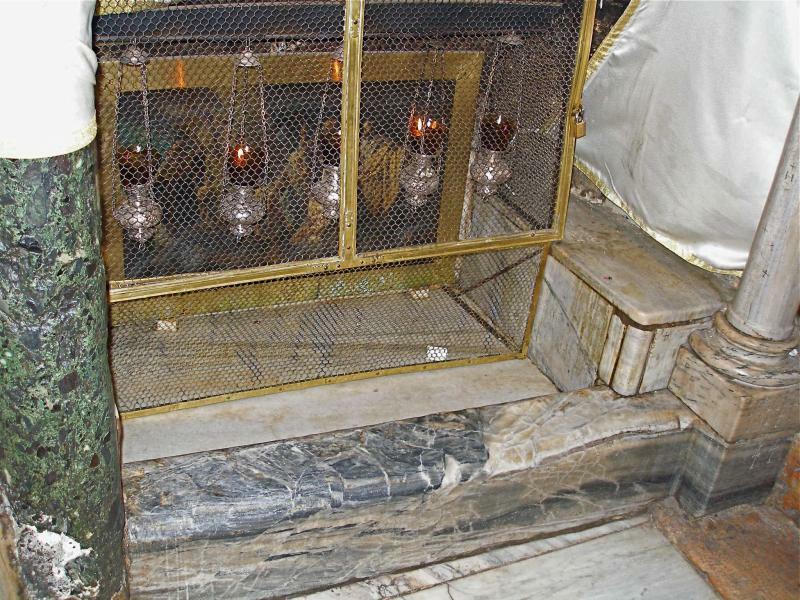 One was said to contain relics of John the Baptist, the other relics of Elisha. Two churches were built during the Byzantine period. One was on the southern side of the Roman acropolis (on the site the Orthodox Church believes John was beheaded). The other church, a cathedral built over the Baptist’s reputed tomb, was just east of the old city walls and within the present village. 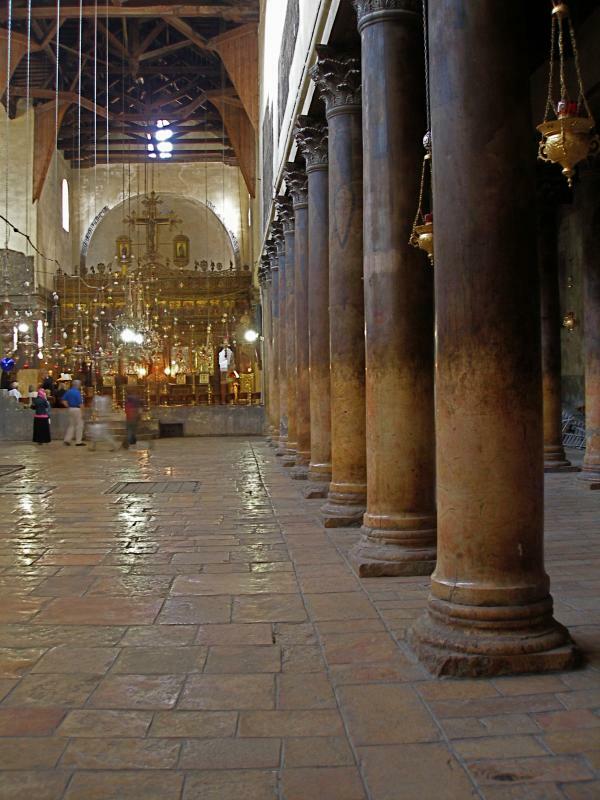 Rebuilt by the Crusaders, it became the second biggest church in the Holy Land (after the Church of the Holy Sepulchre in Jerusalem). 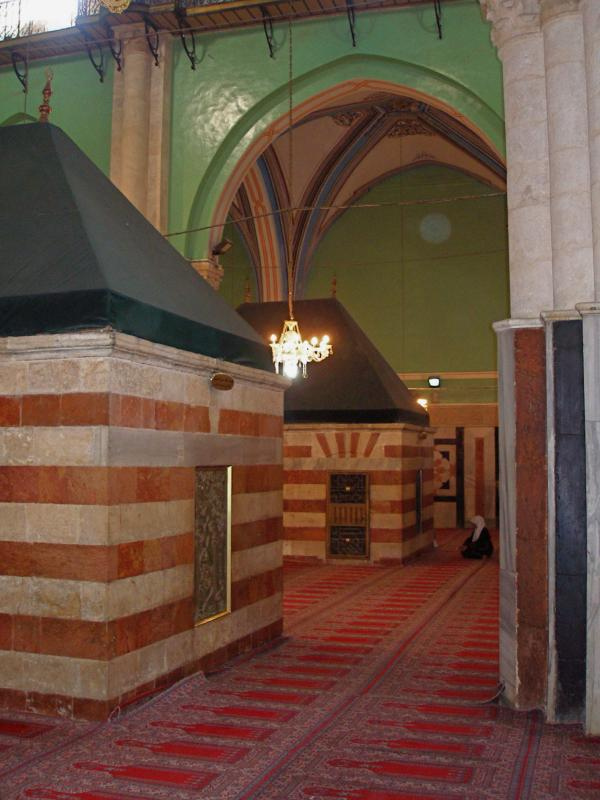 But after the Islamic conquest of 1187 the cathedral was transformed into a mosque dedicated to the prophet Yahya, the Muslim name for John the Baptist. The mosque, rebuilt in 1892 within the ruins of the cathedral, is still in use. 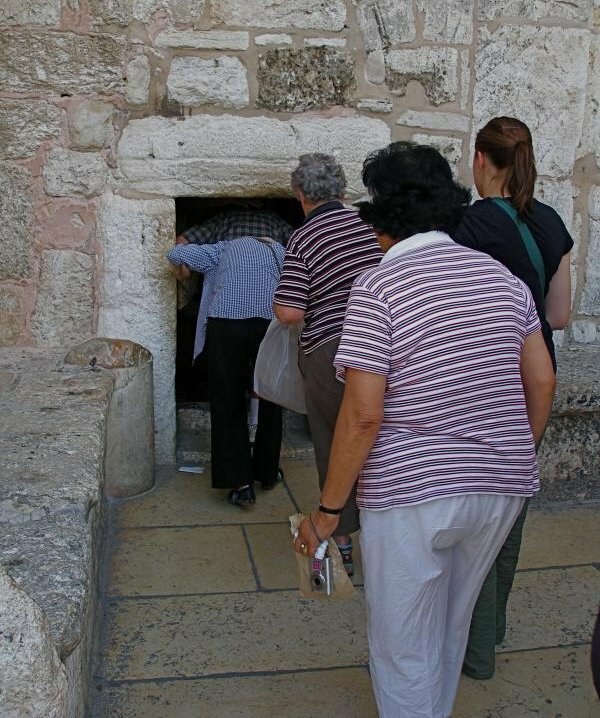 Pilgrims still visit the tomb associated with John the Baptist and other prophets. 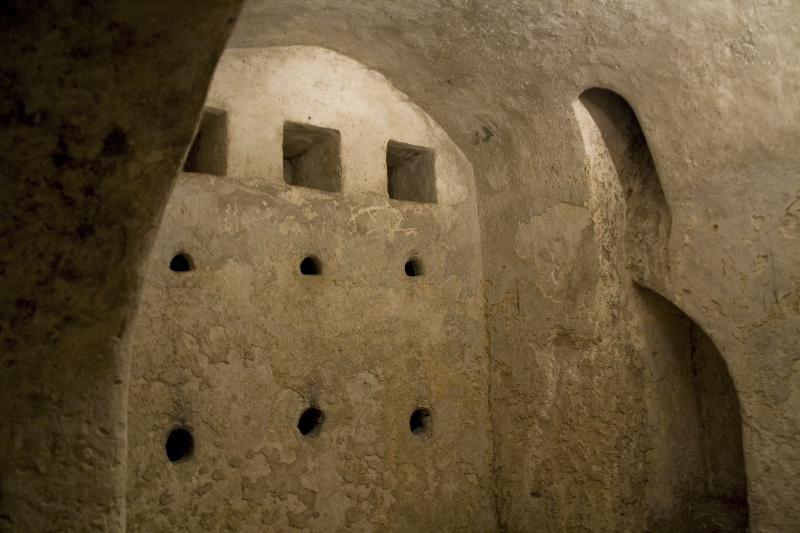 Under a small domed building in the cathedral ruins, a narrow flight of 21 steps leads down to a tomb chamber with six burial niches set in the wall. 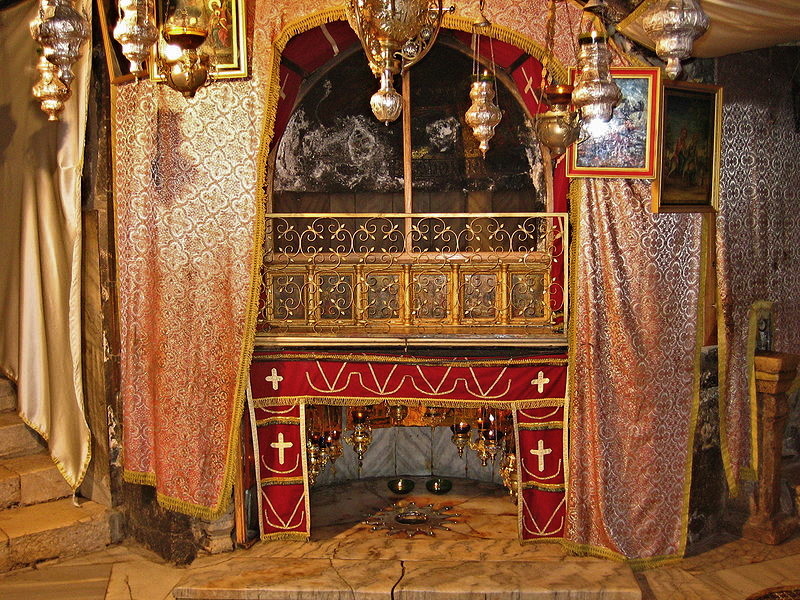 Tradition places John the Baptist’s relics in the lower row, between those of Elisha and Obadiah. The remains of the cathedral’s huge buttressed walls dominate Sebastiya’s public square. 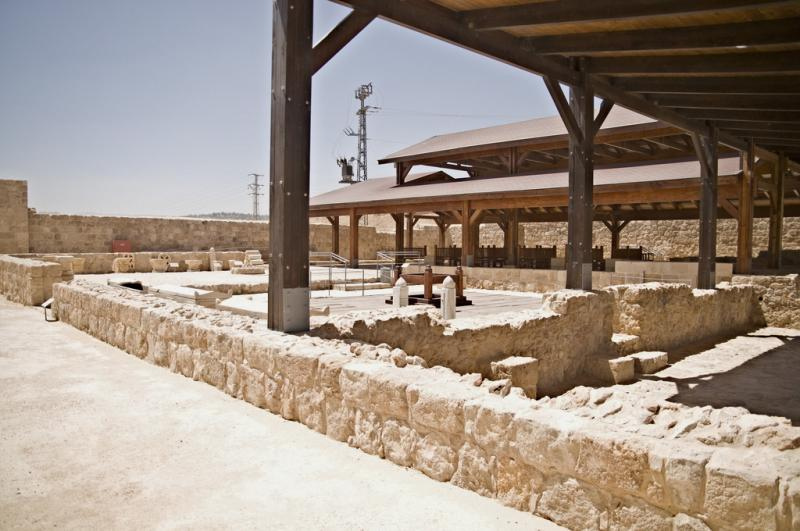 In the extensive archaeological park at the top of the hill are remnants of Ahab’s palace, identified by the discovery of carved ivory that was mentioned in the Bible (1 Kings 22:39). 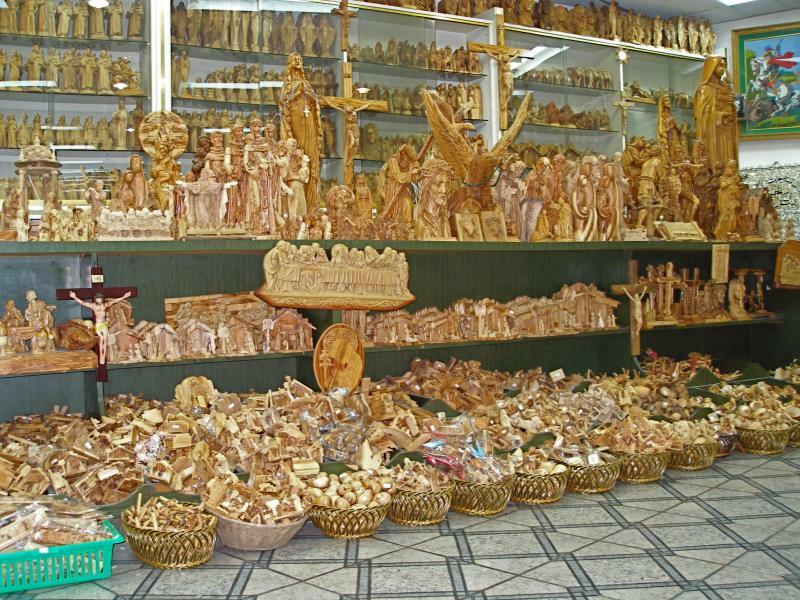 The ivory pieces are displayed in the Rockefeller Museum, Jerusalem. Also to be seen are the stone steps leading to Herod the Great’s temple of Augustus, an 800-metre colonnaded street, a Roman theatre and forum, and a city gate flanked by two watchtowers. 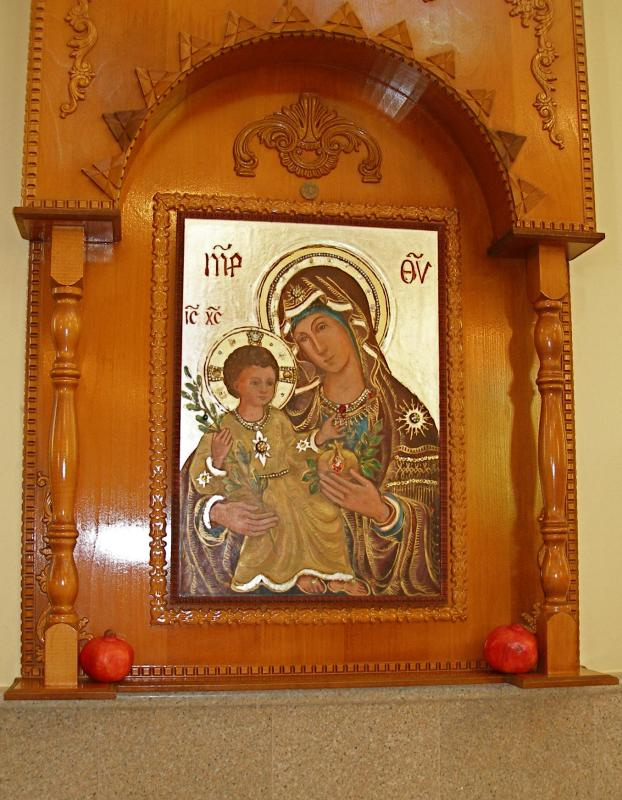 Interest in Sebastiya’s heritage and community — now entirely Muslim except for one Christian family — has been revived in the early 21st century by a project involving the Franciscan non-profit organisation ATS Pro Terra Sancta, funded by Italian aid. 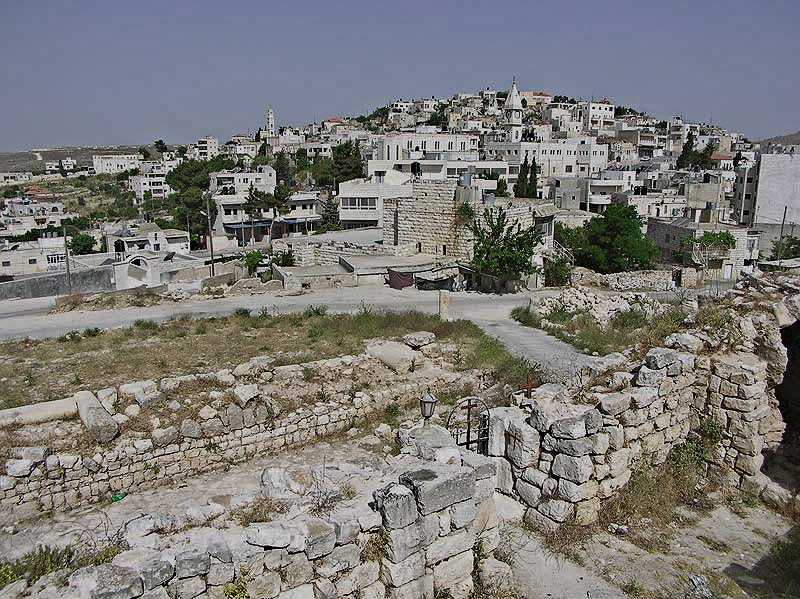 The Palestinian village of Taybeh, the only Christian town left in Israel or Palestine, holds fast to its memory of Jesus seeking refuge there shortly before his crucifixion. The Gospel of John says Jesus went to Taybeh — then called Ephraim — after he raised Lazarus to life and the Jewish authorities planned to put Jesus to death. 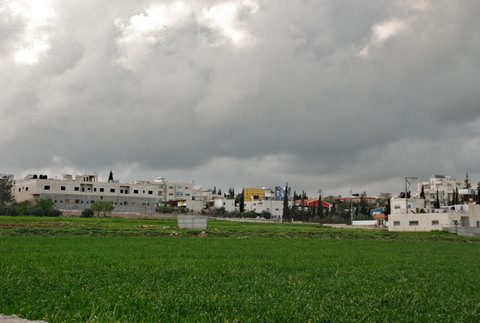 Taybeh (pronounced Tie-bay) is 30 kilometres northeast of Jerusalem and 12 kilometres northeast of Ramallah. From its elevated site between biblical Samaria and Judea, it overlooks the desert wilderness, the Jordan Valley, Jericho and the Dead Sea. 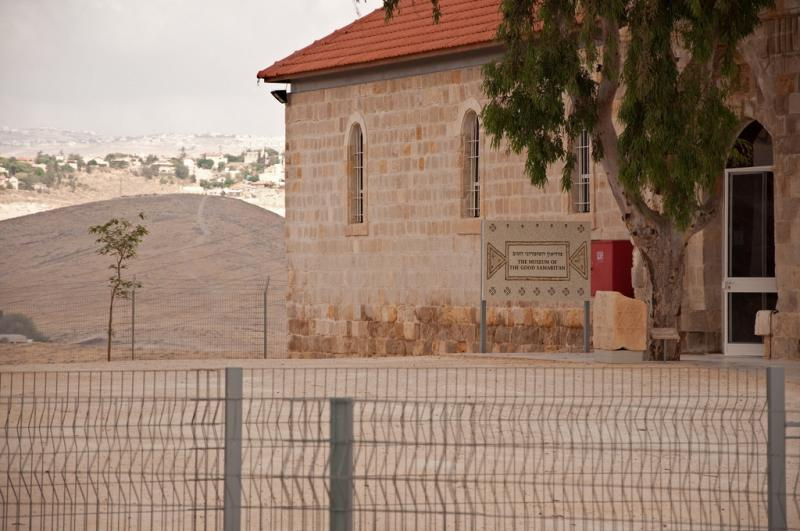 Living amidst Muslim villages, Israeli settlements and military roadblocks, Taybeh’s inhabitants (numbering 1300 in 2010) are intensely proud of their Christian heritage. The village’s Greek Orthodox, Roman Catholic (Latin) and Greek Catholic (Melkite) communities maintain an ecumenical spirit — even celebrating Christmas together on December 25 according to the Western calendar and Easter according to the Eastern calendar. The village of Taybeh was first settled by Canaanites about 2500 years before Jesus came to visit. 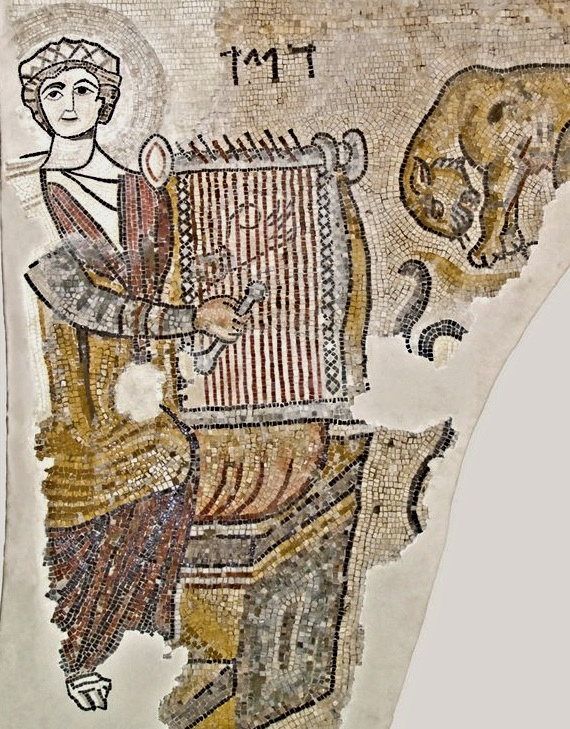 It is mentioned as Ophrah (or Ofrah), a town of the tribe of Benjamin, in Joshua 18:23, and shown on the 6th-century Madaba mosaic map as “Ephron also Ephraia where went the Lord”. The Muslim sultan Saladin changed the biblical name to Taybeh (meaning “good and kind” in Arabic) around 1187 after he found the inhabitants hospitable and generous. The villagers regard St George — whose traditional birthplace is Lod, near Tel Aviv airport — as their patron. The Greek Orthodox and Melkite churches are both named in his honour. They also see the pomegranate as a symbol of the fullness of Jesus’ suffering and Resurrection. This fruit appears as a motif in religious art in Taybeh. A tradition says Jesus told the villagers a parable relating to this fruit, whose sweet seeds are protected by a bitter membrane. Using this image, Jesus explained that to reach the sweetness of his Resurrection he had to go through the bitterness of death. 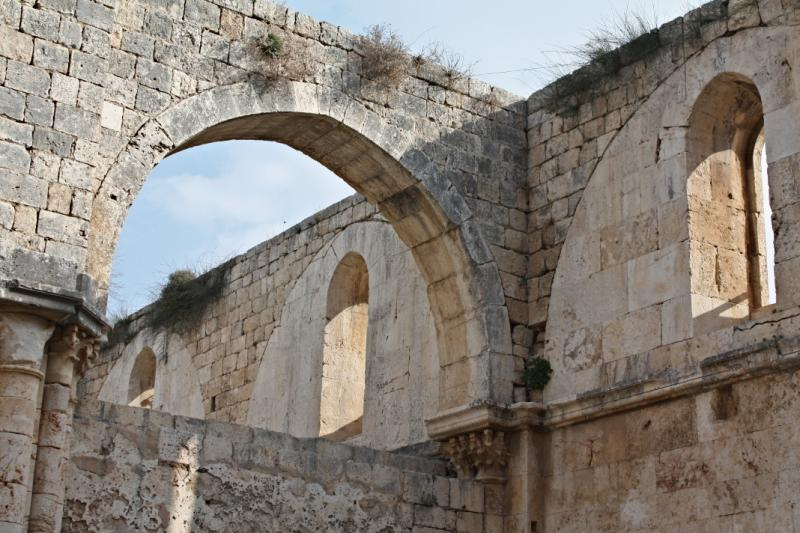 The original Church of St George, built by the Byzantines in the 4th century and rebuilt by the Crusaders in the 12th century, lie in ruins on the eastern outskirts of Taybeh, behind the Melkite church. 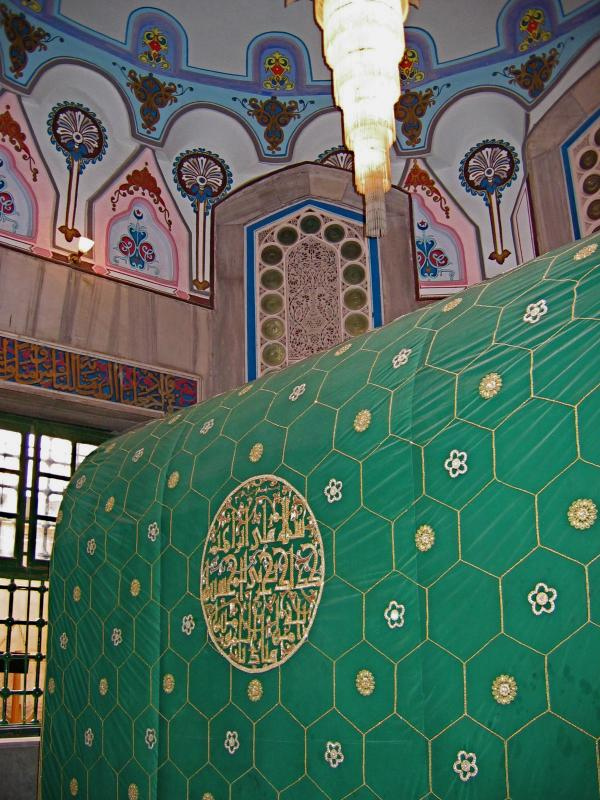 It is called “El Khader” (Arabic for “the Green One”), a name customarily given to St George. A wide flight of steps leads up to an entrance portico, nave, two side chapels and a cruciform baptistery with a well-preserved font. Next to the Greek Orthodox church a 4th-century mosaic depicting birds and flowers has been found. 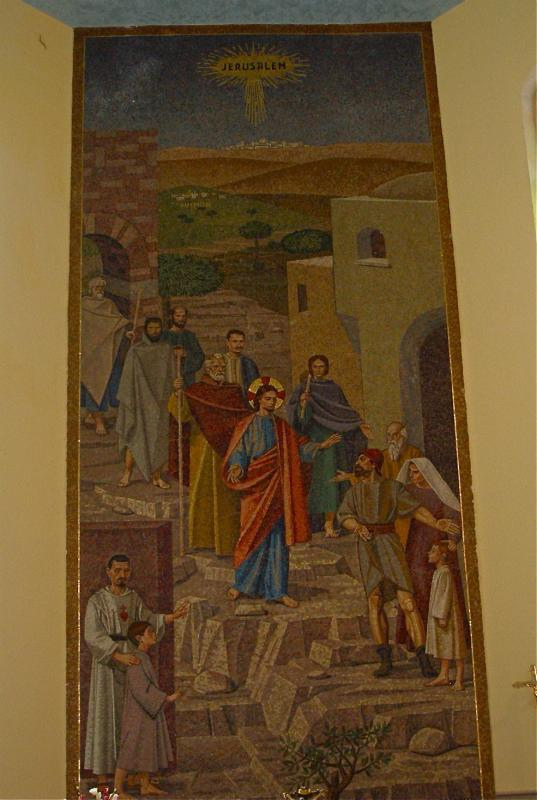 A chapel has been built over the site to protect the mosaic. 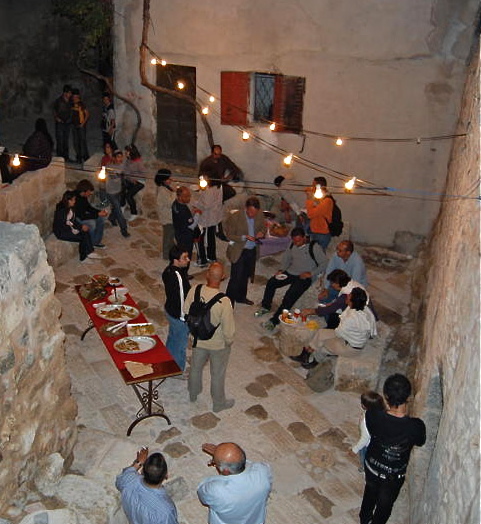 In the courtyard of the Roman Catholic church stands a 250-year-old Palestinian house, occupied by a local Christian family until 1974. The entrance is claimed to be 2000 years old, with five religious symbols of that time engraved in the stone façade above the door. Known as the Parable House, it has rooms on three levels — for the family, for large animals and for smaller animals (who also have an access hole under the old wooden door). 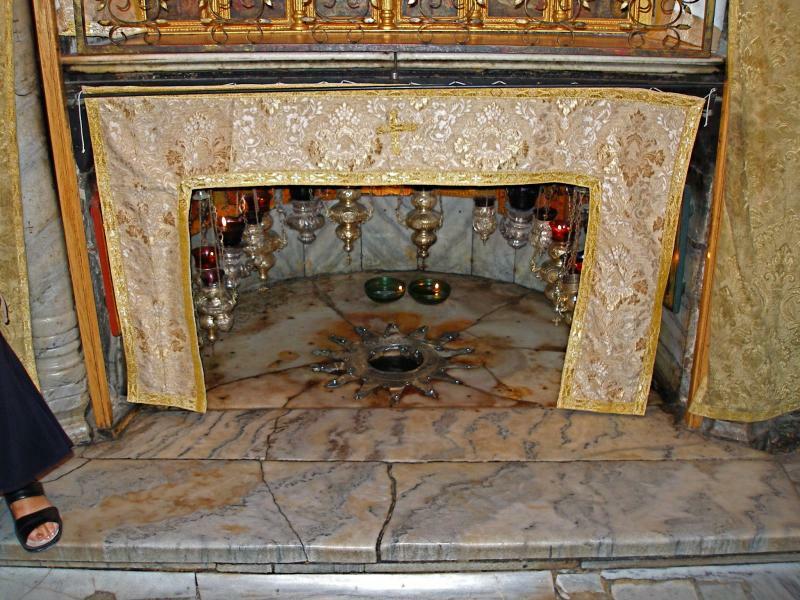 The house and its domestic and agricultural furnishings illustrate the context of many of the parables of Jesus and also offer an insight into how the Nativity cave at Bethlehem may have been configured. 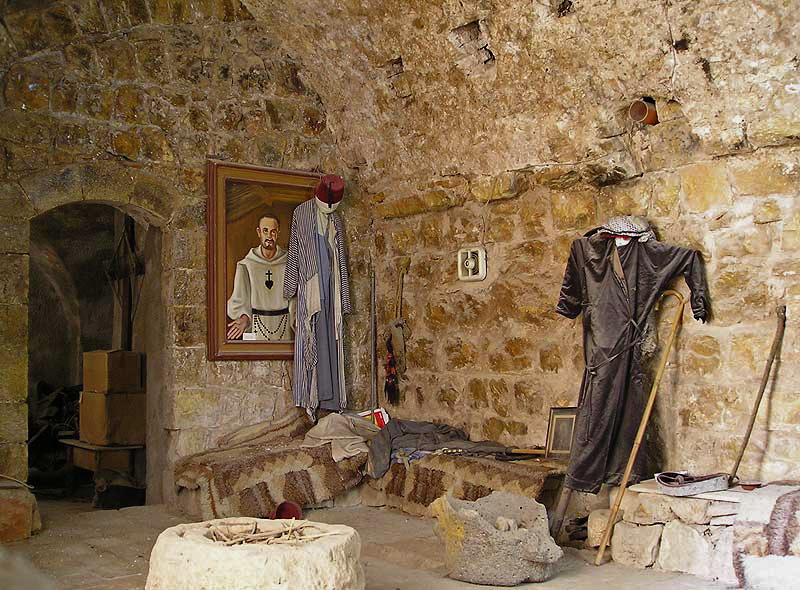 Another celebrated visitor to Taybeh was Charles de Foucauld, a French-born priest, explorer, linguist and hermit who was beatified by the Catholic Church in 2005. De Foucauld passed through Taybeh as a pilgrim in 1889 and returned in 1898 for an eight-day retreat that is recorded in 45 pages of his spiritual writings. After his death (he was shot dead by raiding tribesmen in Algeria in 1916, aged 58), his example inspired the founding of several religious congregations. 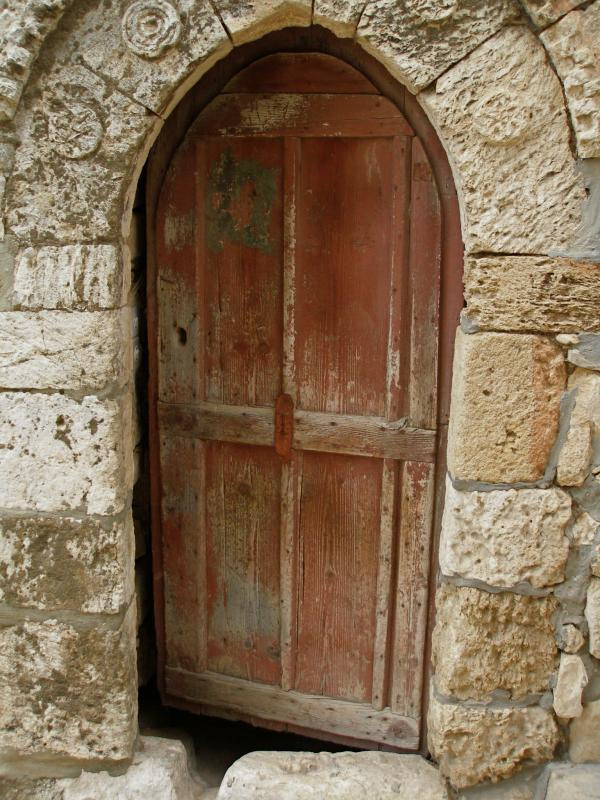 In 1986 a pilgrims’ hostel called the Charles de Foucauld Pilgrim Centre was opened in Taybeh. 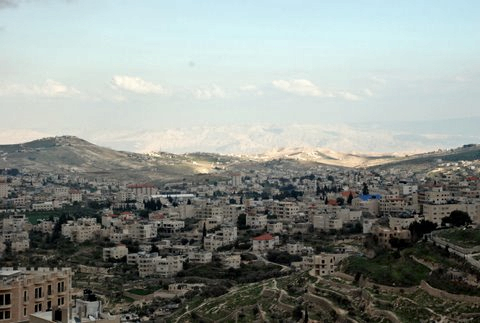 Economic and political pressures have forced some 12,000 residents of Taybeh to emigrate to the Americas, Europe and Australia. 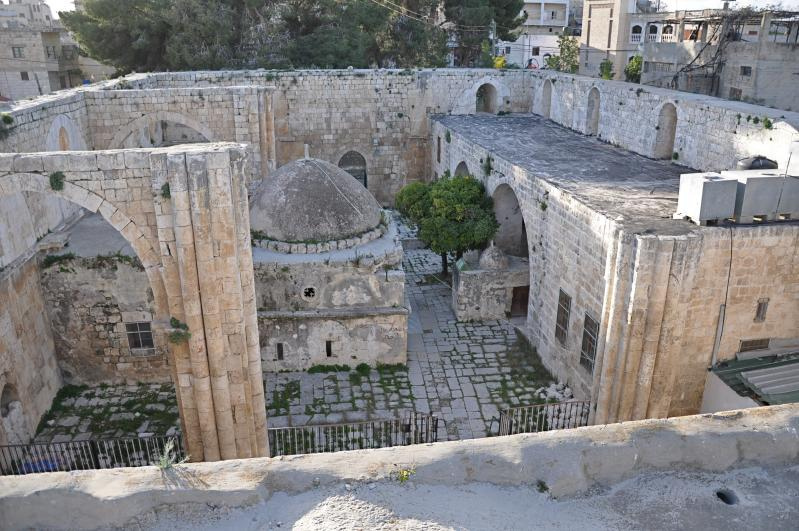 To ensure jobs for those who remain, the churches and the Taybeh Municipal Council are working to improve the local economy. 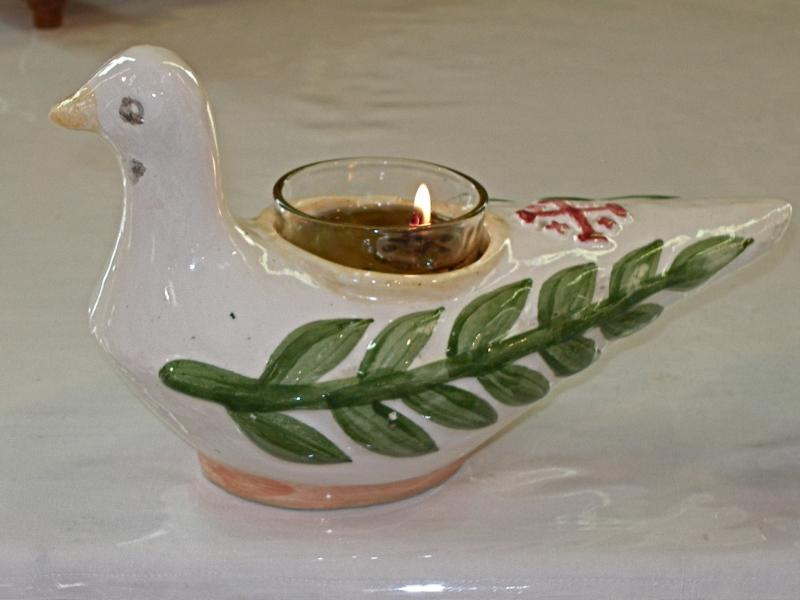 A co-operative to sell olive oil, a ceramic workshop to make dove-shaped peace lamps, and a school to train stone-cutters have been established. 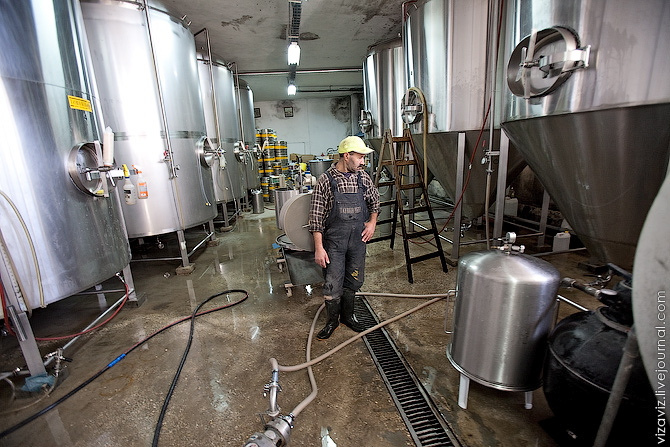 More unusually for a region with a 98 per cent Muslim population, an expatriate family returned to Taybeh in 1995 to open the Middle East’s only microbrewery. Nadim Khoury, who had studied brewing in the United States, opened Taybeh Brewery with his brother David (who became Taybeh’s first democratically-elected mayor in 2005) and their father. Their beer is even brewed under franchise in Germany. An annual beer festival in October, backed by church and community organisations as well as by diplomatic missions, promotes local products, culture and tourism. The Taybeh Oktoberfest attracts thousands each year, including Christians, Muslims, Jews and overseas visitors from as far away as Japan and Brazil. To cater for Muslims — who are forbidden to drink alcohol — the brewery has added non-alcoholic beer to its product line. 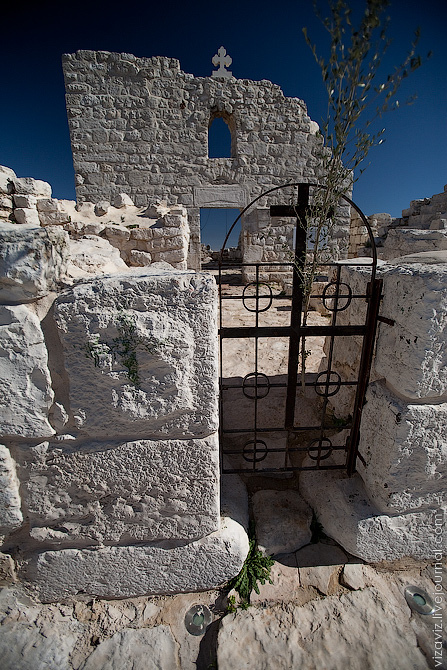 Jacob’s Well, where Jesus asked a Samaritan woman for a drink and offered her “living water”, lies in the crypt of a modern Greek Orthodox church at Nablus in the West Bank. It is often considered the most authentic site in the Holy Land — since no one can move a well that was originally more than 40 metres deep. 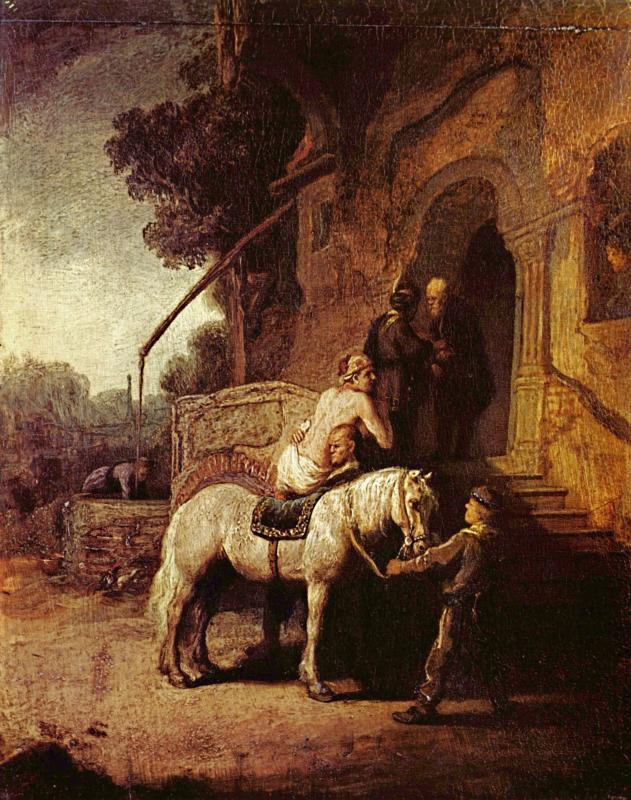 Jewish, Samaritan, Christian and Muslim traditions all associate the well with Jacob. 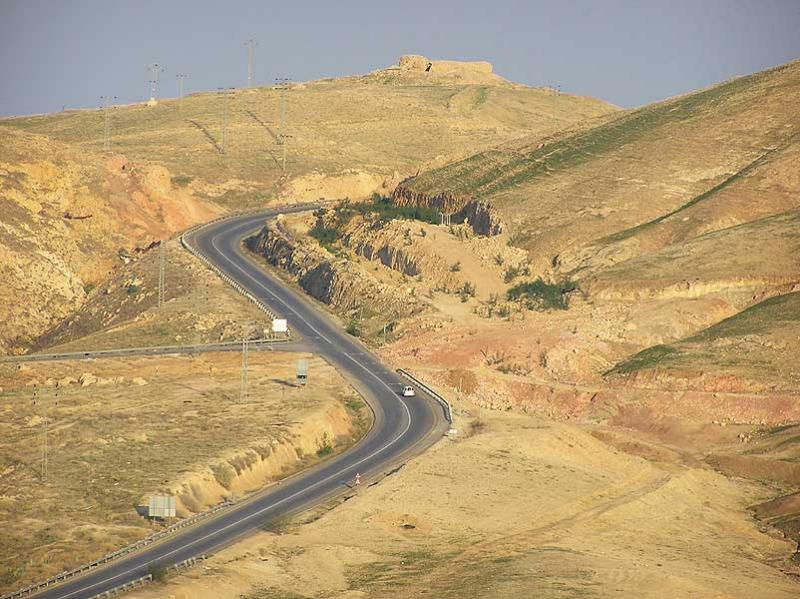 The location, at the entrance to a mountain pass between Mount Gerizim and Mount Ebal, is 2km east of Nablus. It is near the archaeological site of Tell Balata — thought to be the biblical Shechem — and about 63km north of Jerusalem. It was at Shechem that the patriarch Jacob bought “the land on which he had pitched his tent” (Genesis 33:19). Access to Jacob’s Well is by entering the Church of St Photina and descending stairs in front of the iconostasis to the crypt. 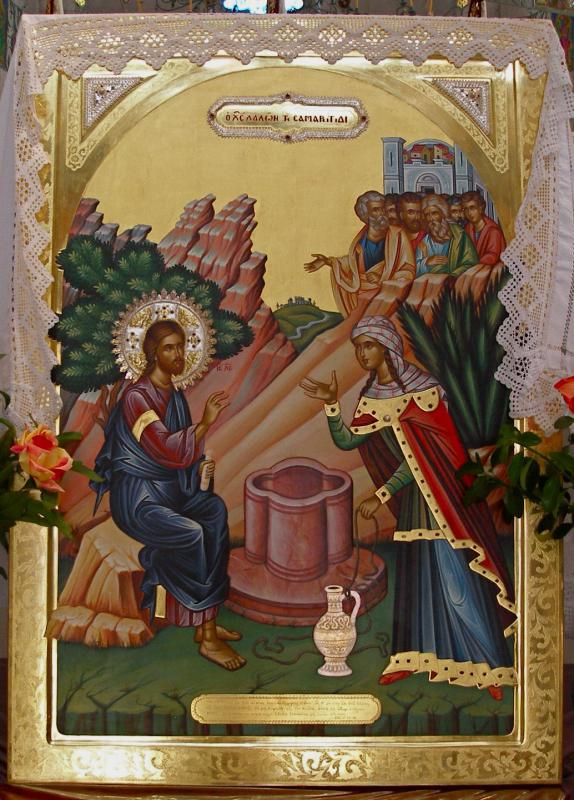 Photina (Svetlana in Russian) is the name Orthodox tradition has given to the Samaritan woman. She is venerated as a martyr who was flayed alive and thrown down a well in Rome by the emperor Nero. A masonry structure surrounds the mouth of the well. On it stands a metal-framed pulley with a coil of rope long enough to reach the water. A neck section about 50cm across and 1.2 metres deep opens into a shaft about 2.5 metres in diameter, hewn through solid rock. 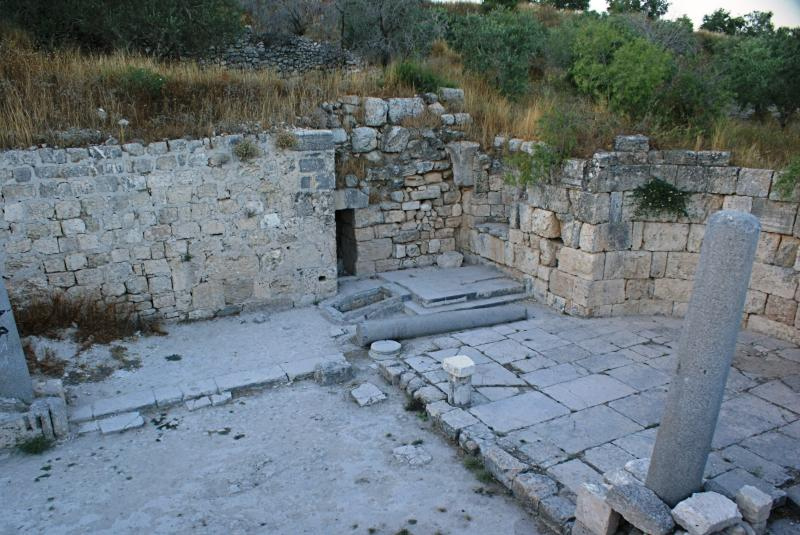 Though the Samaritan woman told Jesus “the well is deep” (John 4:11), measurements of the depth have varied over the years, due to accumulation of debris (and stones dropped by curious visitors). A depth of more than 40 metres recorded in 1935 had reduced to something over 20 metres by the 21st century. In ancient times the well was sunk much deeper, probably twice as far. At times Jacob’s Well has been dry in summer. Because of friction between Jews and Samaritans, the territory of Samaria was usually a “no-go” area for Galileans travelling to or from Jerusalem. The Gospel of Luke (9:51-55) tells of a Samaritan village that refused to receive Jesus because he was going to Jerusalem (on that occasion two of his disciples wanted to bring fire from heaven down on the village). 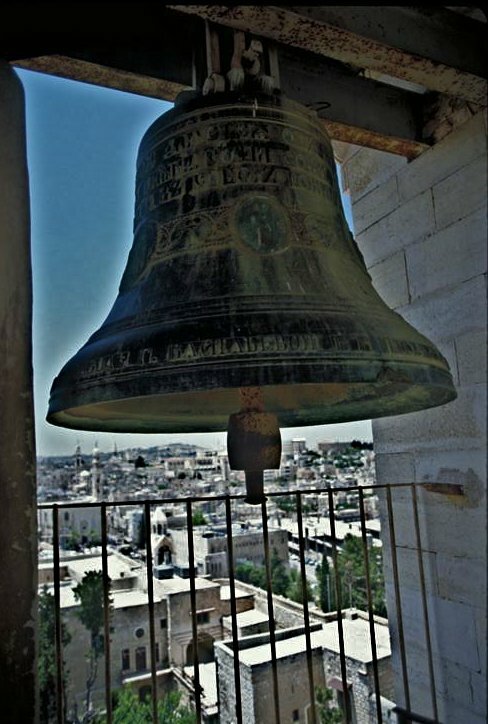 Samaritans have their origins in Judaism but, as the woman at the well pointed out to Jesus (John 4:20), they worship on Mount Gerizim rather than in Jerusalem. They also regard Moses as the only prophet and accept only the first five books of the Old Testament (the Books of Moses, or the Torah). The Samaritans at one time numbered in the hundreds of thousands but by 2007 only 700 remained, living mostly at Mount Gerizim and near Tel Aviv. 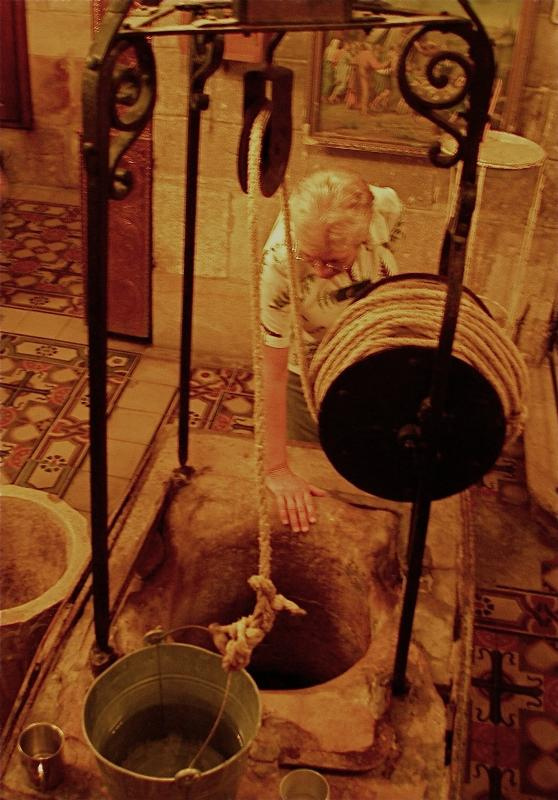 Pilgrims’ writings refer to Christian veneration of Jacob’s Well from the 3rd century. The earliest source, the anonymous Pilgrim of Bordeaux, mentions a bath (presumed to be a baptistry) that took its water from the well. A cruciform church built around 380 was the first of a succession of churches erected over the well. One of them appears in the 6th-century Madaba mosaic map. In 1860 the Greek Orthodox Church acquired the property and began restoring the crypt. Construction of a new church was hindered by the 1917 Russian Revolution, which halted Russian funding, and by an earthquake in 1927. 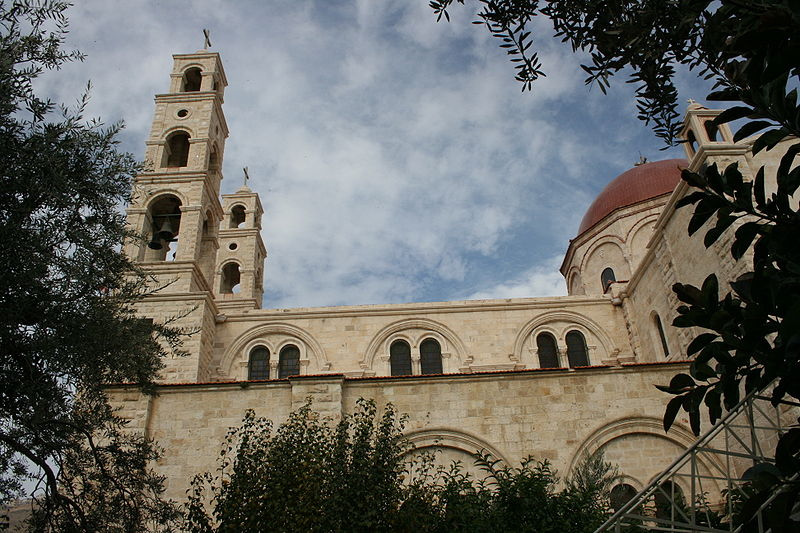 The present church, completed in 2007, is modelled on a basilica from the Crusader era. 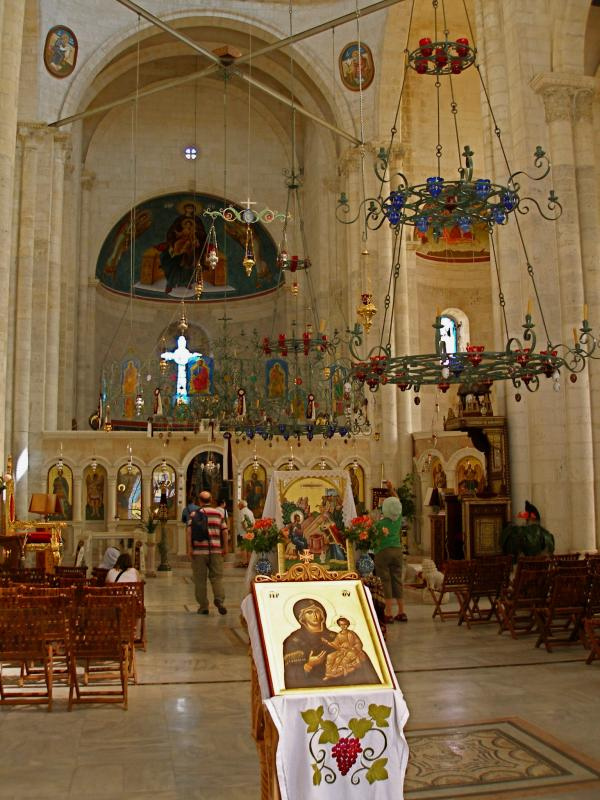 In an attractive setting of trees and pot plants, it is well-lit, spacious and airy — a contrast to older Orthodox churches in the Holy Land. Framed icons in modern style and bright colours are fixed to walls and ceilings, rather than being rendered on to these surfaces. Nablus was an arena of conflict between militant Palestinians and the Israel Defence Force during the Second Intifada, between 2000 and 2005, but has since rebuilt itself as an industrial and commercial centre. Jacob’s Well has also been a site of contention and violence. 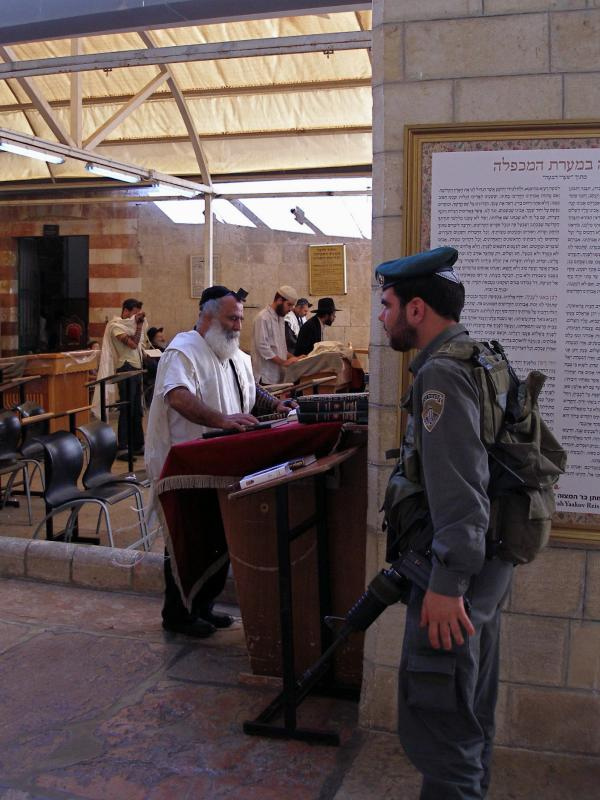 In 1979 a Zionist group claimed it as a Jewish holy place and demanded that crosses and icons be removed. A week later the custodian, Archimandrite Philoumenos, was butchered to death in the crypt and the church was desecrated. No one was ever convicted of his murder. 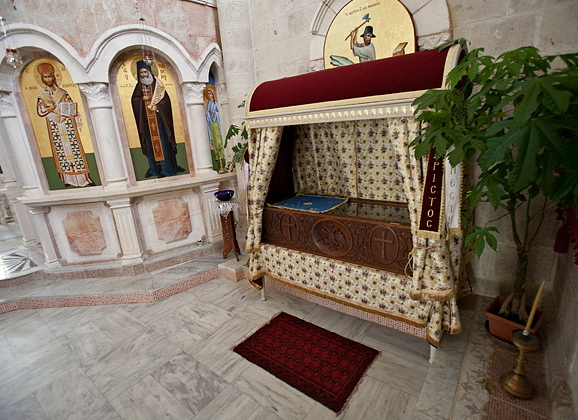 The remains of Archimandrite Philoumenos are venerated in the right-hand chapel of the Church of St Photina. 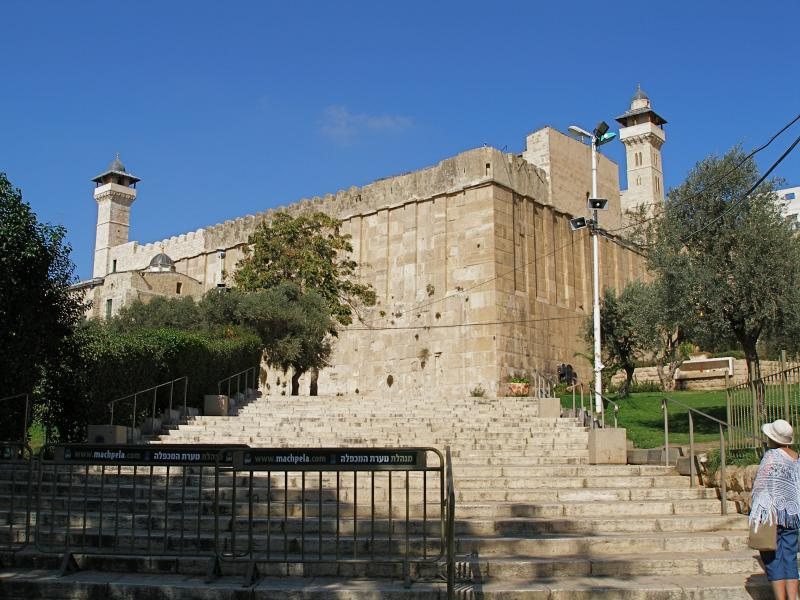 North of Jacob’s Well is a related site, Joseph’s Tomb. 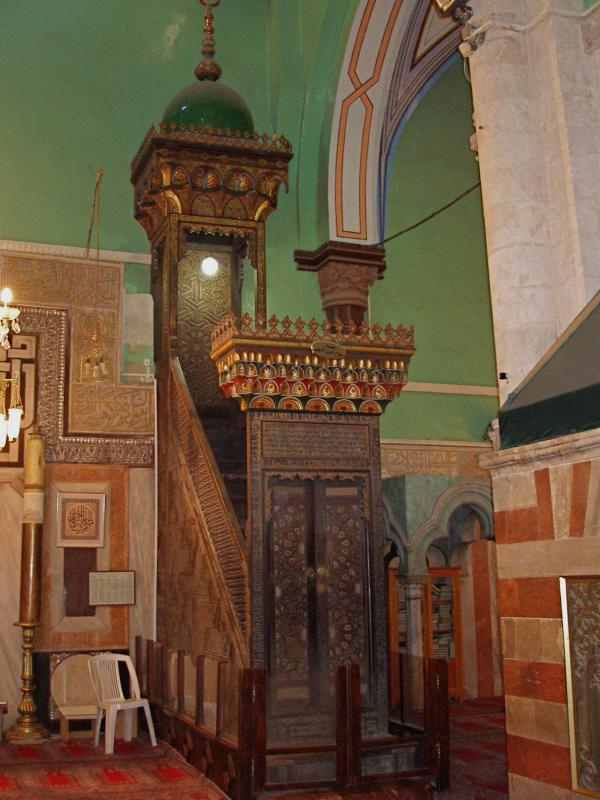 This white-domed tomb is believed to be where the bones of Jacob’s son Joseph were buried after being brought back from Egypt (Joshua 24:32). The summit of the mount, about 360 metres above sea level, offers a spectacular panoramic view of the Jordan Valley, the Dead Sea and the mountains of Moab and Gilead. 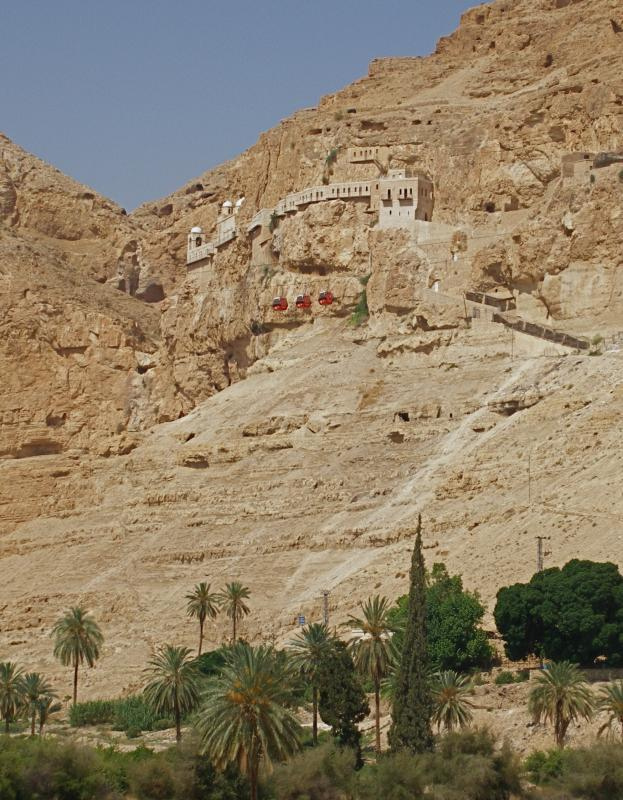 The Mount of Temptation is about 5km north-west of the West Bank city of Jericho. 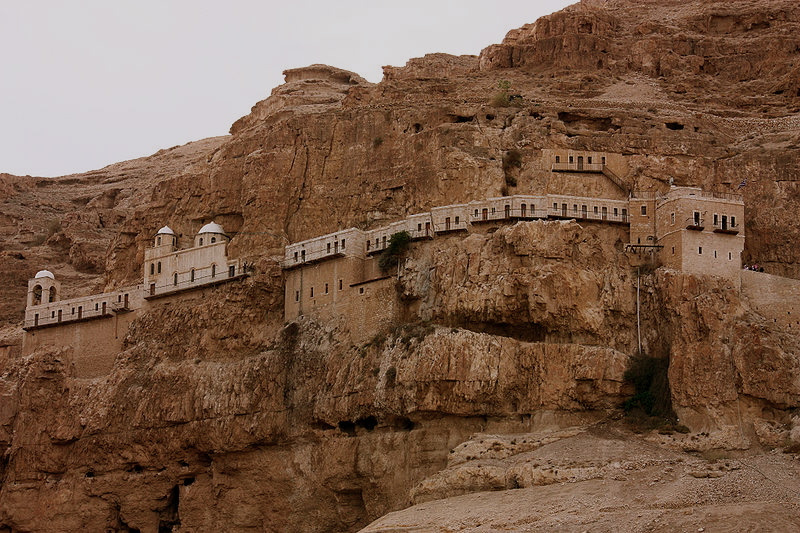 Access to the summit is by a 30-minute trek up a steep path — passing through the cliffhanging monastery on the way — or by a 5-minute cable car ride from Tel Jericho. Unlike some Greek Orthodox monasteries, the Monastery of the Temptation allows women visitors as well as men. The mountain is also known as Mount Quarantania and Jebel Quarantul. Both names arise from a mispronunciation of the Latin word Quarentena, meaning 40, the number of days in Christ’s fast. This period of fasting became the model for the practice of Lent in Christian churches. As recorded in the Gospels of Matthew (4:1-11) and Luke (4:1-13) — and fleetingly in Mark (1:12-13) — the Holy Spirit led Jesus into the desert. While he fasted, the devil tempted him three times to prove his divinity by demonstrating his supernatural powers. Each time, Jesus rebuffed the tempter with a quotation from the Book of Deuteronomy. Then the devil left and angels brought food to Jesus, who was famished. 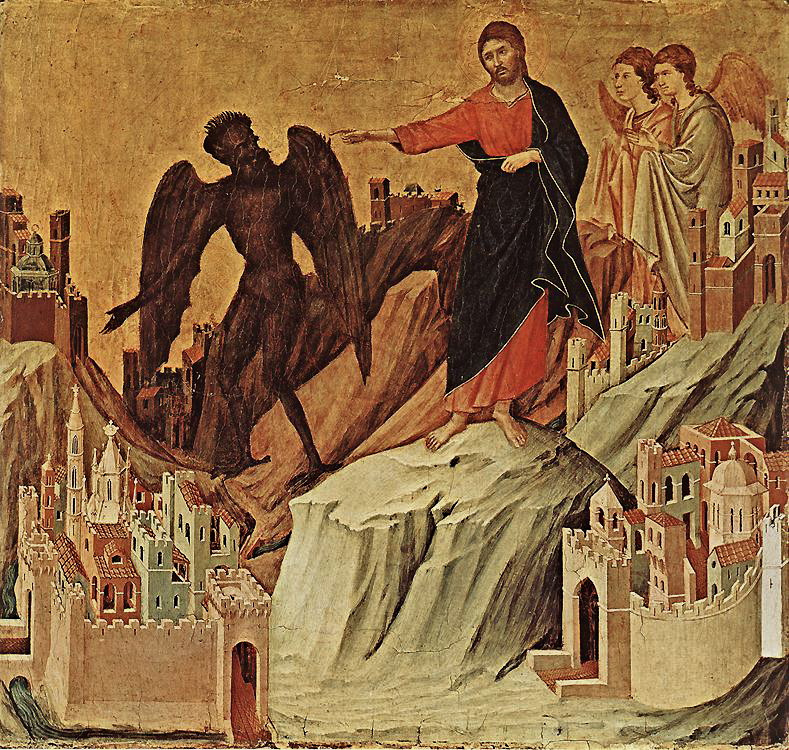 Tradition dating from the 12th century places two of the devil’s temptings on the Mount of Temptation. The temptation to turn a stone into bread is located in a grotto halfway up the mountain. The offer of all the kingdoms of the world in return for worshipping the devil is located on the summit. Monks and hermits have inhabited the mountain since the early centuries of Christianity. 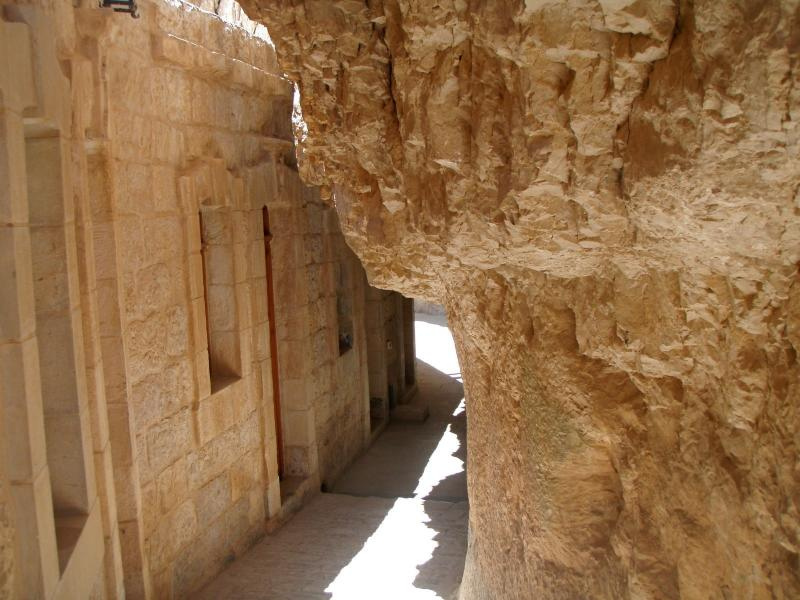 They lived in natural caves, which they turned into cells, chapels and storage rooms. A sophisticated system of conduits brought rainwater from a large catchment area into five caves used as reservoirs. 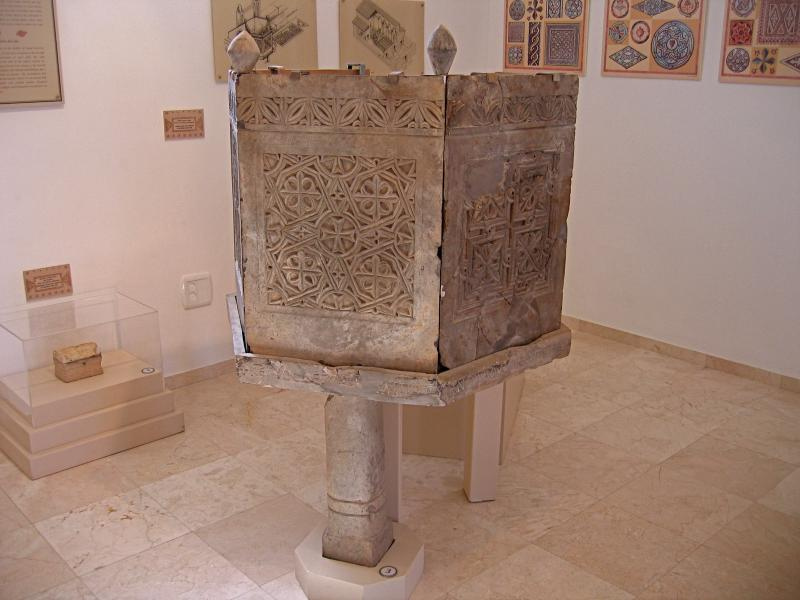 A 4th-century Byzantine monastery was built on the ruins of a Hasmonean-Herodian fortress. The monks abandoned the site after the Persian invasion of 614. The present Monastery of the Temptation, reconstructed at the end of the 19th century, seems to grow out of the mountain. The northern half is cut into the almost sheer cliff, while the southern half is cantilevered into space. A medieval cave-church, on two levels, is built of masonry in front of a cave. In the monastery is a stone on which, according to tradition, Jesus sat during one of his temptations. In the valley of this mountain, Jewish priests and Levites travelled the winding road from Jericho to Jerusalem when it was their turn to minister in the Temple. In the time of Jesus, about 12,000 priests and Levites lived in Jericho.